Family, friends, aquaintences, champions and well-wishers gather at Angas'. Baddy's boat and board formed the centrepoint of the circle. The point trying to produce a few for the send-off. 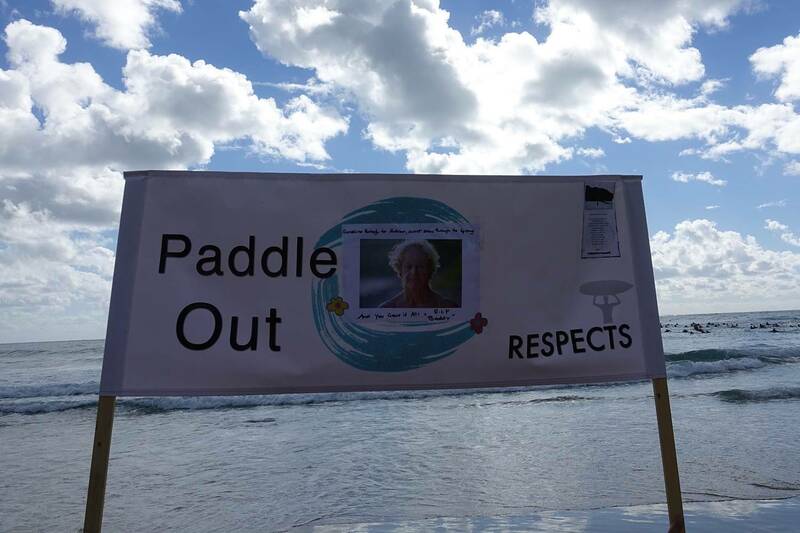 Paddle out and pay your respects. One of the largest paddle outs we've seen. Says a lot about the man. Streaming out to pay tribute. The morning of the paddle-out was special. Nat with a few words for an old friend. The sendoff sunrise was a belter. A small cross-section of the enormous crowd. Two world champs were on hand to pay respect. On the fourth of April 2019 the surfing community in Angourie bade farewell to one of its own; the huge, raucous, intense, hilarious, caring, lovable and passionate red headed rogue David ‘Baddy’ Treloar. 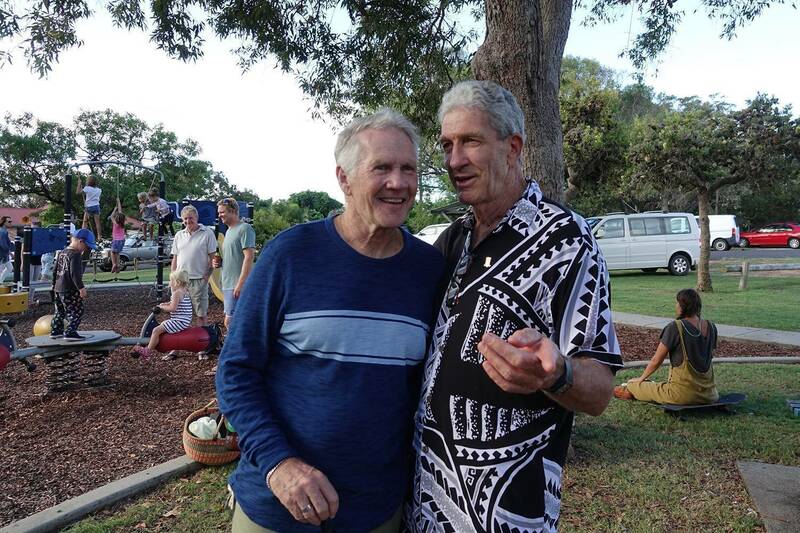 Born in Manly in 1951 into a family that had saltwater pumping through their veins, Baddy commenced what would be the making of a surfing legend at the age of seven at Manly Beach. Baddy’s brother, Graham, competed in the 1965 world surfing titles held in Manly, but unfortunately passed away when he was quite young. Baddy immediately took the baton and ran with it and was soon surfing with and competing against Wayne Lynch, one of the hottest and most popular surfers the country has ever seen. Not only was Baddy one of the smoothest and most stylish surfers of his era, but he was also a fisherman of exceptional ability from his early years. His simple philosophy later on in life was ‘All I want to do is surf and fish’ and he relentlessly pursued that idyll till the very end. He always had a restless spirit and soon tired of Sydney and city living. 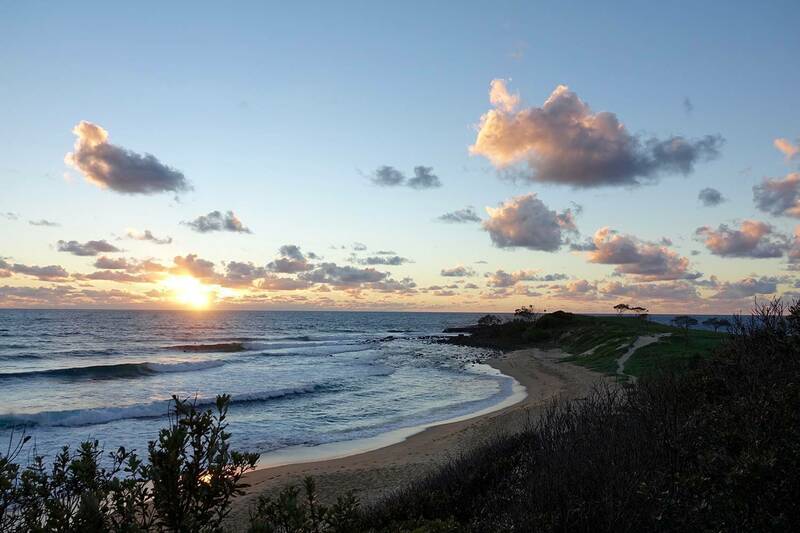 By the late sixties he was regularly travelling from Manly to Angourie, enjoying the world-class wave when it was an exclusive enclave for only a handful of surfers. A few years later in 1972 Alby Falzon’s timeless classic ‘Morning of the Earth’ featured Baddy and made him into a kind of cult hero – not that Baddy cared for fame or recognition. But like it or not the image of Baddy vigorously sanding a board outdoors without a mask on and then running along Angourie Point with his fresh stick – all set to the music of Simple Ben – is legendary in the surfing world and is burned in our memories forever. Baddy loved Angourie and in the early seventies he bought into Wilderness Surfboards. It wasn’t long before he moved up there permanently and that's where he lived out the remainder of his saltwater filled life. 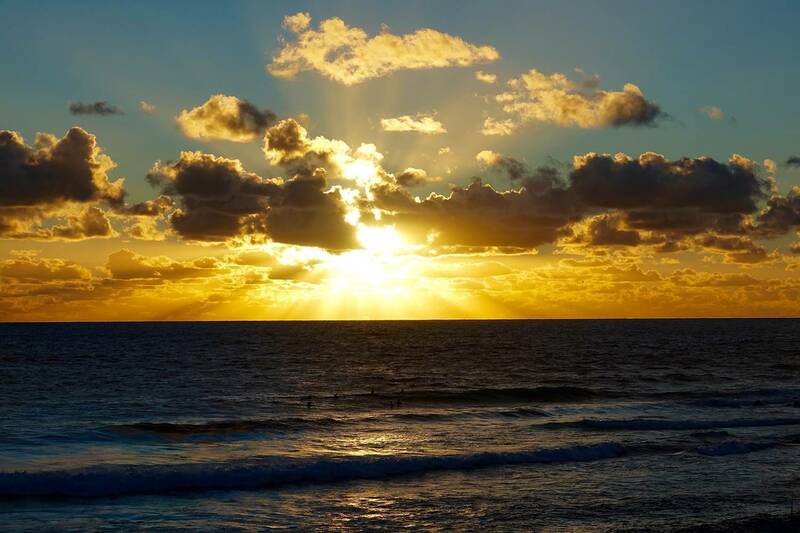 Before moving permanently to Angourie he was a Manly boy, working as a lifeguard and living life to the fullest as we did in Sydney in the seventies. 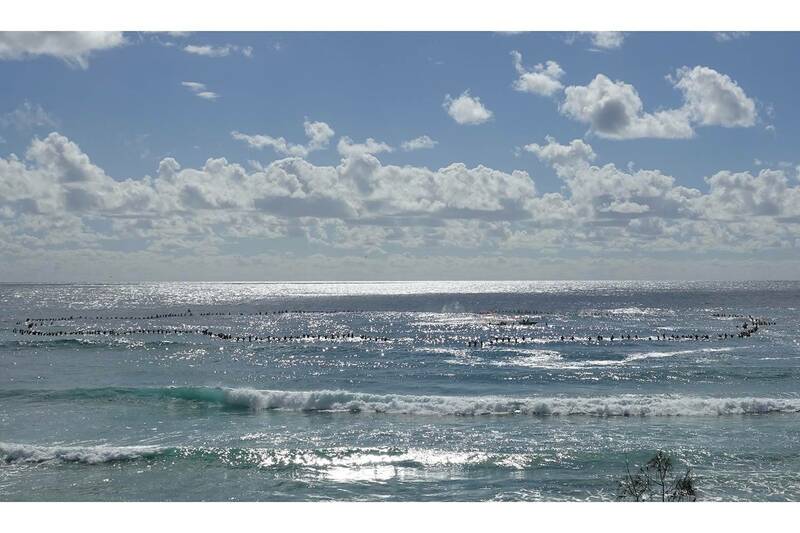 Our lives were quite uncomplicated and involved lots of surfing, frequenting the Steyne Hotel, girls, smoking pot and watching our beloved Manly Sea Eagles play on the hill at Brookvale Oval. Growing up in Manly and being a mate of Baddy’s we used to go on many surfing trips. 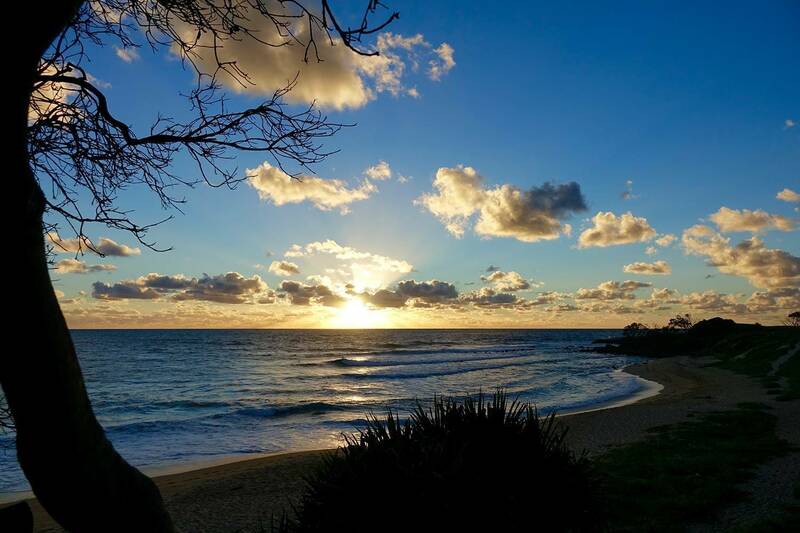 Whilst he was still living in Sydney road trips to Treachery Beach near Seal Rocks were a regular way to escape the city grind. I remember this one time during a mid-week swell when Baddy knew there’d be some waves up there and before we knew it our boards were strapped on the car and we were gone. During the three and a half hour drive to Treachery, whilst passing through Newcastle, the skies suddenly opened up and it bucketed down. Baddy being the older and wiser guy started bellowing at me to slow down due to road works in progress and the bad weather. Of course being the younger, reckless guy I didn’t and a car travelling in the opposite direction flicked up a rock from its tyre that smashed our windscreen. Baddy turned to me with the heaviest of death stares and in his deepest, gruff, monotone, bellowed “Danny, I told you to slow down”! Replacing the windscreen was never an option as we were heading straight to the surf no matter what, so after reluctantly cleaning up the shattered glass we continued on in the pouring rain with no windscreen and with towels wrapped around our heads and our sunnies on for protection against the elements. About twenty minutes later we were soaked and windswept, but the rain abated and we pulled off the highway onto a bush track to smash out a few bongs. As we sat there off our heads, out of nowhere an emu stuck its head into the car where once was the windscreen and we nearly had kittens. Soon before we knew it there were at least ten, huge giant-beaked, prehistoric birds trying to peck us, not viciously just inquisitively. When we realised our lives were not in danger we laughed until we couldn’t breathe and continued to laugh about it for days after and for years to come. And for the next few days following the emu incident we ended up getting excellent waves with nobody else out in the surf except for Baddy and myself for most of our sessions. A time I’ll never forget. There are a squillion Baddy stories that we could share but surfing and fishing are at the forefront of most. I used to own a little tinny that we kept on Shelly beach in Manly and Baddy and I regularly fished off Ferry Bower at night. Baddy would row out and I’d roll a fat joint and we’d catch whatever was biting that night. Occasionally we’d hook a baby shark and he loved unhooking them and throwing them in the boat to let them thrash around our bare feet and he would laugh so loud he’d nearly wake up the dead; then he’d throw it back overboard to join its mates. Even then his fishing skills were superb, as was his sense of humour. Not long after another one of his many Angourie sojourns the wanderlust engulfed him for the last time and he packed his bags and moved back there to his spiritual home and stayed there never to return until his last breath was taken after his final surf at his beloved break, just over a week ago. Baddy’s life in Angourie encompassed what he loved doing – surfing, fishing and drinking copious amounts of tea and dunking biscuits. In all of these things he was the King. If he liked you Baddy gave you all his knowledge, encouragement and support. 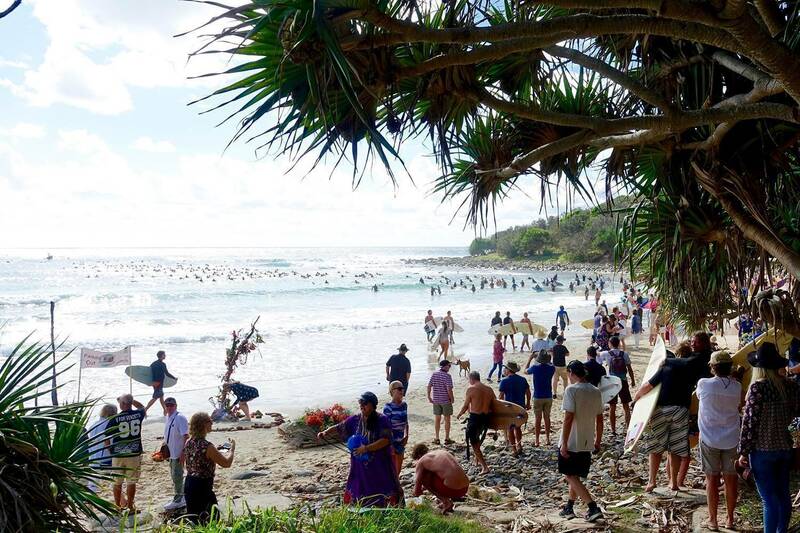 The hundreds of friends, family and surfers who sent Baddy off in a passionate and traditional surfers paddle out ceremony was testimony to the people he touched throughout his life. 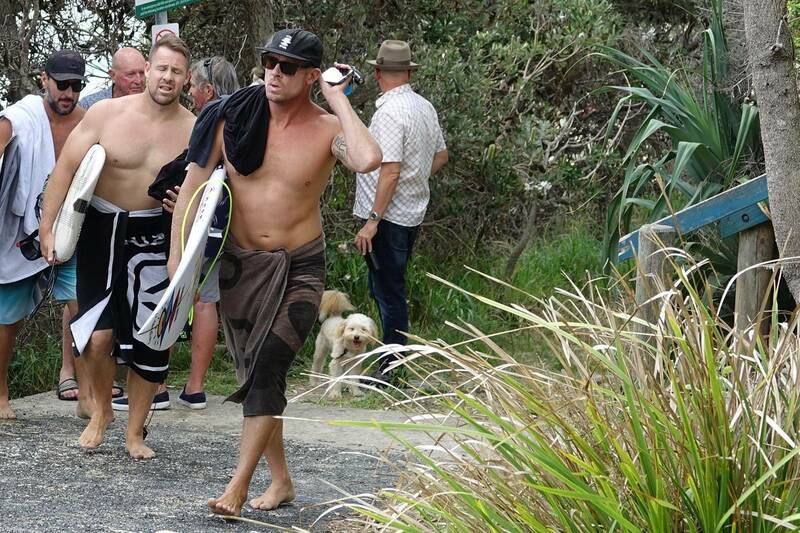 Past world champions including Nat Young, Mick Fanning and Joel Parkinson were there with what seemed like the entire town and all his surf mates from up and down the coast. All paddling out to form a circle the size of a suburb and farewell one of the most incredible and passionate humans that ever graced the ocean. 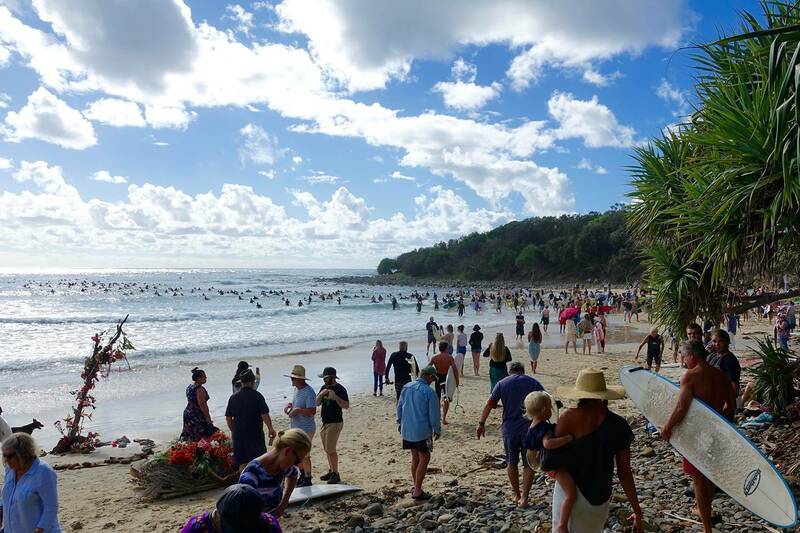 Having Baddy’s boat and his surfboard inside the centre of the ceremony made the paddle out memorial all the more poignant. He loved Angourie and no one knew it better. 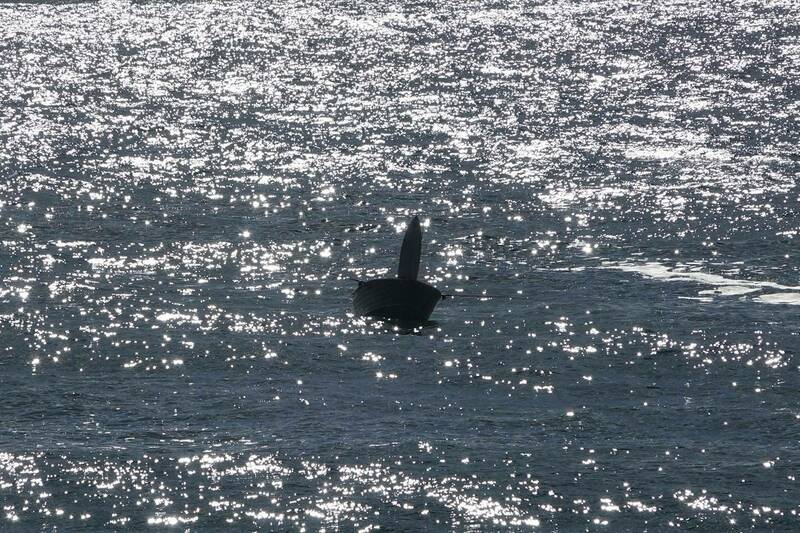 His relationship with the wave and performances on the larger days will always be celebrated, as will his knowledge of the ocean where he regularly fished by landmarks (no sonar equipment in Baddy’s boats). His influence and the legacy he leaves will last for generations to come and just hearing the stories at his sendoff and the profound impact he had on all those close to him will ensure he is remembered forever. David ‘Baddy’ Treloar we are going to miss you tremendously.